Single Implants can be used to replace individual missing teeth and provide a long term and healthy alternative to either a partial denture or a conventional bridge (which usually involves cutting down healthy adjacent teeth). Single implants usually come in three parts. 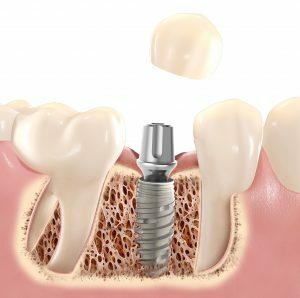 The actual implant is a piece of titanium which is inserted into your jaw bone and your own bone then grows around and fuses to the implant making it incredibly strong (this process usually takes around 12 weeks). If bone is required it is usually inserted at the implant placement appointment and then a peg (or abutment) is screwed onto the implant. Finally a custom made crown is cemented or screwed onto the abutment. Because the implant is made of three components, it means that if ever your crown is damaged it can easily be removed and replaced. All our crowns and bridges are individually customised by our onsite technicians to perfectly match your other teeth and this is one of the main advantages of coming to us for your treatment. It is also sometimes possible to restore two teeth with just one implant. The start to finish treatment time for single implants is usually 12 weeks and normally involves 5 appointments.. Appointment 5: Crown and abutment fit. Implant Bridges are a cost effective way of replacing several missing teeth and filling larger gaps in the mouth restoring more teeth with fewer implants. If you would like to know more about single implants and implant bridges, please do not hesitate to get in touch with one of our team today.